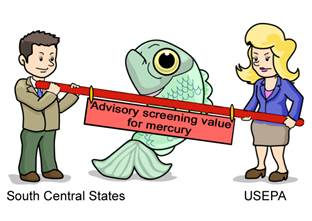 Fish consumption advisories are used to inform citizens about fish with potentially hazardous levels of toxins such as methyl mercury. When investigators examined five states that set their own recommendations regarding screening values for methyl mercury, the team found that the states issued fish consumption advisories for fewer than half of the water bodies that would have advisories if recommendations by the US Environmental Protection Agency (EPA) were followed. The analysis also reveals that the need for fish consumption advisories is greatest for the largest size categories of fish. Up to 65% of the 766 sites examined would need new advisories for trophy-sized fish if federal recommendations were followed. "The states are responsible for warning the general public about gamefish with levels of mercury that are hazardous to human health. The public is not aware that the states and EPA are not in agreement about the level of mercury in fish that is considered to be hazardous," said Dr. Ray Drenner, co-author of the Environmental Toxicology & Chemistry article. "The public is also not aware that the states do not have the resources to sample all sizes of gamefish in all waterbodies. We hope our study has shed some light on this issue and that the states and EPA will work together to develop policies that protect the public from the hazards of consuming mercury-contaminated fish."